Tanisha Ford’s scholarship offers the first study of its kind to trace the transnational evolution of what she terms “soul style” — an African-inspired mode of dress and hairstyling — as it emerged in the 1960s and ’70s. Even though her work is rooted in the past, Tanisha Ford takes a thoroughly modern approach to it. Trained in 20th century U.S. and Black women’s history, the University of Massachusetts Amherst assistant professor is strictly 21st century in her approach to writing and teaching about the lives of Black women in the U.S., Britain and the African diaspora. Ford’s scholarship offers the first study of its kind to trace the transnational evolution of what she terms “soul style” — an African-inspired mode of dress and hairstyling — as it emerged in the 1960s and ’70s. Described by her Department of Women, Gender, Sexuality Studies chair as an “up-and-coming star in African-American women’s history,” Ford’s personal style is far removed from that of dowdy-looking bookworm. She is feminist, fashionable and fly, as she describes herself. On a Facebook update earlier this year, Ford posted a photo of herself “rockin,” as she put it, a new makeup shade on the first day of class. 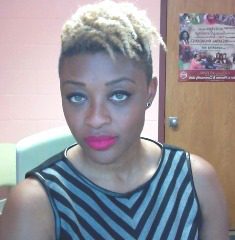 “Do not be alarmed,” she told her students, “I am a young, fly, black woman … and I AM your professor!” The Facebook post included the hashtag #feministfierce. Her research showed why it was hard for Black women to maintain “a respectable Sunday best look with the straightened hair, dresses and skirts, pearl earrings and heels.” Women in the movement were being attacked by police dogs, sprayed with water hoses and jailed, Ford explains. They weren’t able to keep up with grooming, nor could they afford to buy nice clothes and get their hair styled regularly. “Out of this was birthed a political dress aesthetic where they started to embrace this unadorned, natural hair look and see that as part of the aesthetic politics of the movement itself,” she says. Last summer the Journal of Southern History published her article, “SNCC Women, Denim, and the Politics of Dress.” She is currently writing a book, “Liberated Threads: Black Women and the Politics of Adornment,” which uncovers how and why Black women use beauty culture and fashion as a form of resistance and cultural-political expression. Ford names Tiffany Gill, associate professor in the Department of Black American Studies and the Department of History at the University of Delaware, who has also written about Black women entrepreneurs and the field of beauty care, as a great influence on her work. This scholarly work may have never happened had Ford not heard a lecture by Claude Clegg, former chair of the Indiana University Department of History, when she was an undergraduate. Clegg talked about how he researched a biography by digging through FBI files and piecing together newspaper clippings. The lecture sealed the deal on Ford wanting to study history. After earning her master’s in Afro-American Studies from the University of Wisconsin-Madison, Ford returned to IU for her doctorate, and Clegg ended up being her adviser.